Home / News / UNC Bioinformatics and Computational Biology Graduate Students Dan Oreper and Yanwei Cai are joint first authors on paper published in G3 Journal. 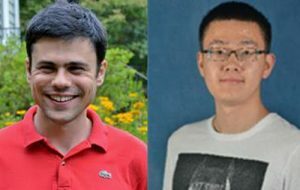 UNC Bioinformatics and Computational Biology Graduate Students Dan Oreper and Yanwei Cai are joint first authors on paper published in G3 Journal. Congratulations to Dan Oreper and Yanwei Cai (Valdar Lab) for their recent paper in G3 Journal titled “Inbred Strain Variant Database (ISVdb): A repository for probabilistically informed sequence differences among the Collaborative Cross strains and their founders.” The manuscript describes the development of a database [http://isvdb.unc.edu] for genetics researchers using the Collaborative Cross (CC) and other inbred mouse strains. Rather than merely holding data, the database software uses a series of probabilistic calculations to several sources of data at once — on genotypes, haplotypes and sequencing-based variant annotation – to give probabilistic predictions of both the state and functional consequences of sequence variants present across the genomes of CC and derived populations. Dan and Yanwei’s publication may be read at http://www.g3journal.org/content/7/6/1623.